All politicians should be required to drink Ayahuasca at least ten times before taking office. A quote from one of my favorite authors and plant medicine influencers Graham Hancock. I think he stated this in one of his appearances of the Joe Rogan Podcast. Throughout social media I have seen this quote in many different versions. Those who understand the power of plant medicines will definitely agree this idea can be a great part of the solution to change the broken model of modern political systems. But what if this idea is actually happening around the world as we speak? What if I tell you that this idea is actually the way it works in some cultures. I was fortunate enough to witness the procedure above during my stay with the Huni Kuin Indians. There are still cultures where overall decision making is done with the help of plant medicines. I t was my first ceremony in the main village and outside of Europe. More than sixty people gathered to their church, which respectively is a big open house with a roof in the middle of the jungle. The ceremony was planned to start around 21:00 hours. Many new faces came arrived from different villages around the area. While the kids were playing music and singing, the men sat down and chatted, the women were decorating each other with beautiful facial paintings. These sacred geometry paintings offer protection for bad spirits. When the ceremony was about to start we headed out to the church. About 65 people gathered in their sacred ceremony space. It was a beautiful display of tribal leaders and members from different villages. Some looked like warriors ready for battle with their colourful warbonnets (or headdresses) made from feathers. But tonight these warriors were out for a peaceful gathering. Tonight was about their future. Tribe leader Ixa started the ceremony talking about politics. The new local elections were coming up. Throughout the years many politicians made promises towards the Huni Kuin people in order to get their votes. Many of these promises made by the “white people” (referred as non-indigenous) were broken or never got attention afterwards. There are multiple examples where money was offered to help the Indians protecting their land, provide education and medical support. Torched by a broken political system and after following the money the Indians sadly draw their conclusions. It seemed the promised money got spend on new cars and bigger houses for the politicians. “If we want somebody to represent the Huni Kuin people, we need to vote for somebody from our own community. That is the only way to make a real change. Only they know what is truly important for our future, to protect our land and precious culture.” This night Ixa presented three men as a representative for the Huni Kuin people, including his own nephew. Although tribe leader Ixa makes the final decisions for this tribe, it was not only him making the decision. “Tonight we will drink the medicine together and the spirit of Yuxibu (The Huni Kuin spirit that represents the creator of all.) will help us define the right candidate. Tomorrow we will know who will represent us in the elections.” These words were followed by an 8 hours ceremony with plant medicines and sacred chants. 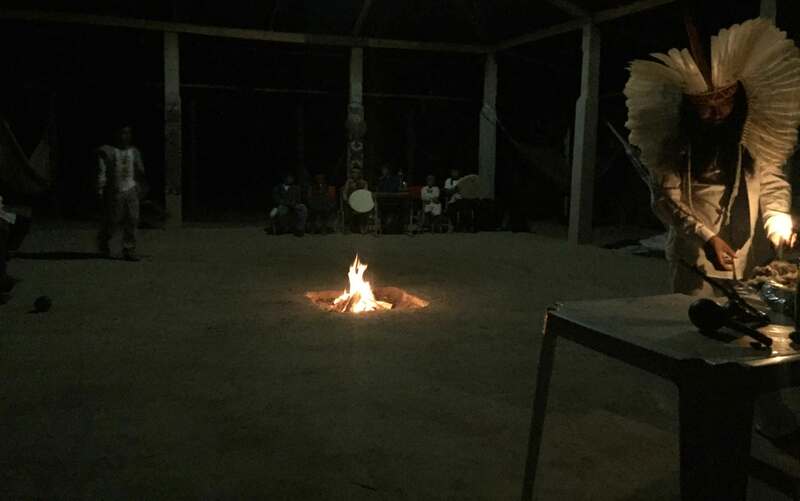 Every week the Huni Kuin indians come together for “Nixi Pae” ceremonies, this is the Huni Kuin name for Ayahuasca. Young kids, adults and the elder people participate. The village lives by shamanism. Every village has a few shamans of healers. This doesn’t mean the other villagers are not involved in healing & shamanism. Everyone grows up with shamanism printed in their DNA. Their immense respect for mother nature is probably the biggest part in this. The forest provides everything they need. Growing up in a western society this way of doing politics is way out of our sights. Can you imagine Donald Trump and Obama drinking plant medicines to get agreements decisions regarding building oil pipelines through sacred indian land? Or going to war for oil? The outcomes would be more peaceful, human and less harmful for the global world and it’s environment. It reminded there are still cultures that are fully guided by nature. The practice of shamanism is so deeply embedded in their way of living, it has no time for modern day politics. Witnessing this special occasion makes me believe this is the most honest and peaceful way to do it. Every tribe members believes the Yuxibu spirit is guiding them to a better time and place. The elected politicians are chosen by the creator of all, their god, the Yuxibu spirit. This way ensures everyone’s agreement and support, no matter what the final outcome is.